From the Images list screen, click an image or edit to open it. 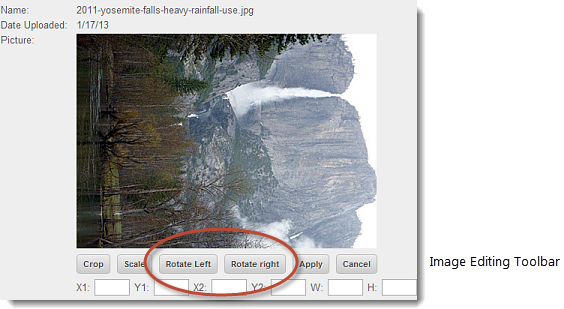 Click the Rotate Left or Rotate Right button on the Image Editing toolbar. Rotate Left rotates the image 90° counter clockwise; Rotate Right rotates the image 90° clockwise. Save to complete the rotation, or click Cancel & Reload on the top toolbar to restore the image’s orientation. Click Crop on the Image Editing toolbar. Click and drag the selection cursor (see below) to define the crop area. Drag a sizing handle on the crop border to resize the crop area. Move a crop area by placing your cursor inside the crop area. 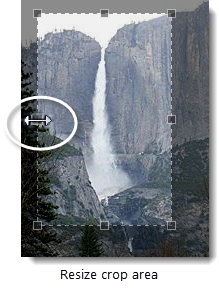 When the move cursor displays (see below), click and drag the crop area to the desired location. Click Apply Crop to crop the image. You may cancel the crop by clicking Cancel on the image editing toolbar. Save to complete the crop.